Am I Left or Right Brained? This is something we always end up asking ourselves every once in a while. Some of us do not even know what being right or left brained is. Right brained people are mostly creative, and left brained people are logical. You can be more of a right brained, more of a left brained, or balanced between the two. The only way to find out about is to take a Left Brain Right Brain Test. 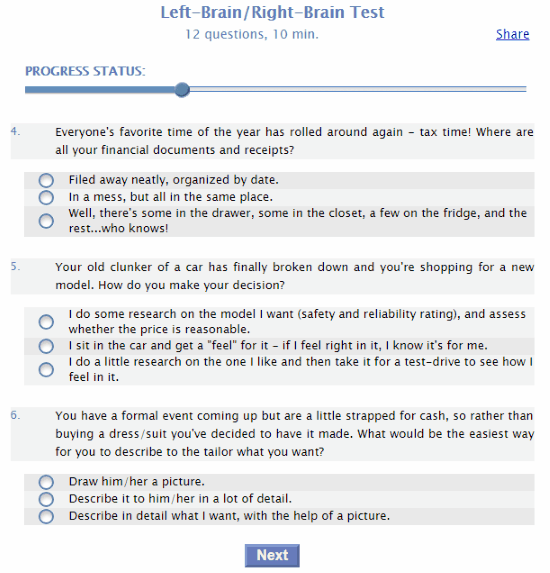 Let us checkout some of the best online Left Brain Right Brain Test websites out there. These test ask you several questions along with options. According to the options selected, these websites tell whether you are left or right brained. Here, you will find tests which tell if you are a introvert or extrovert. Left or Right Brain Test is a test from A Real Me with 31 questions. 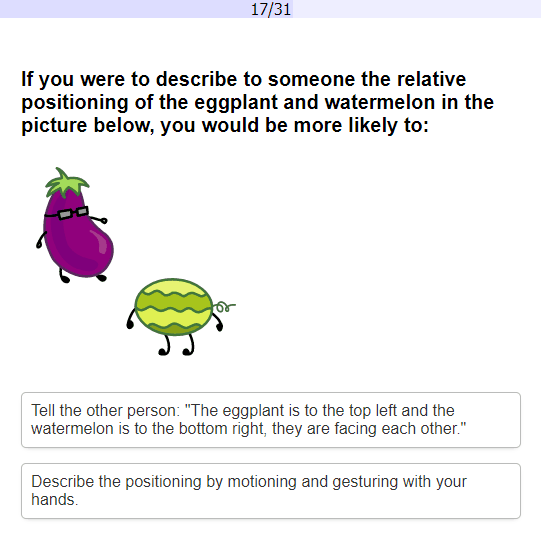 These questions test if you are left brained or right brained in different ways. Some questions ask about your preference, some are regarding patterns, some are about directions, and more. When the test ends, you will get the answer in percentage. You get the inclination towards both left and right brains in percentage. 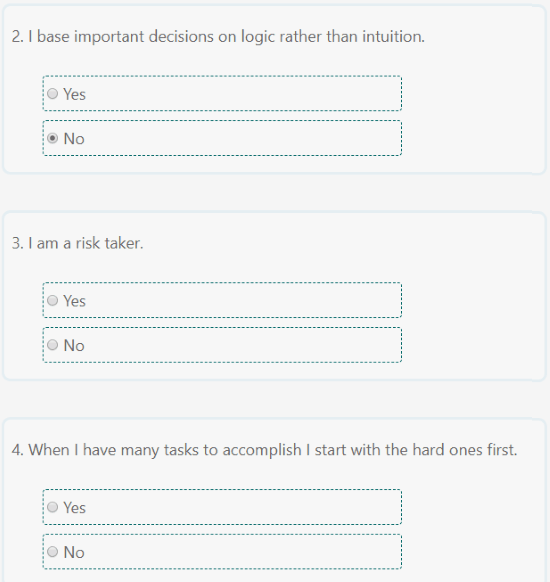 Left-Brain/Right-Brain Test from Psychtests puts you through 12 questions. The estimated duration of the test is 10 minutes. In addition, you will also be asked a set of questions which is a mixture of your personal information and your behavior/performance in academics and workplace. The result page explains the concept of right brain and left brain in details. On a scale, you will get to see your inclination towards left or right, followed by some more personalized details. Right-brained? Left-brained? 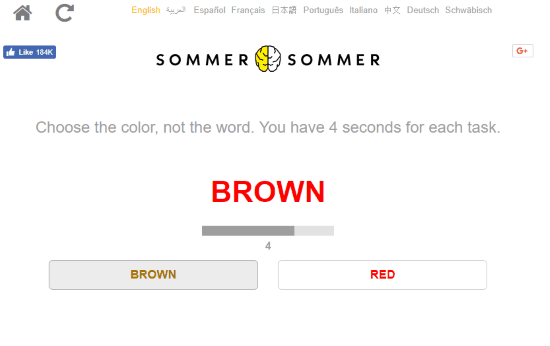 is an interesting test which you can find on Sommer Sommer’s website. What makes this test interesting is that it includes visual tests as well as physical tests. It is a test you must give a try. At the end of test, you simply get the inclination of your brain on both left and right side in percentage. You can also share the test result on several social media sites or as email. Left-brain/right-brain test is a 20 questions long test to check your brain inclination. 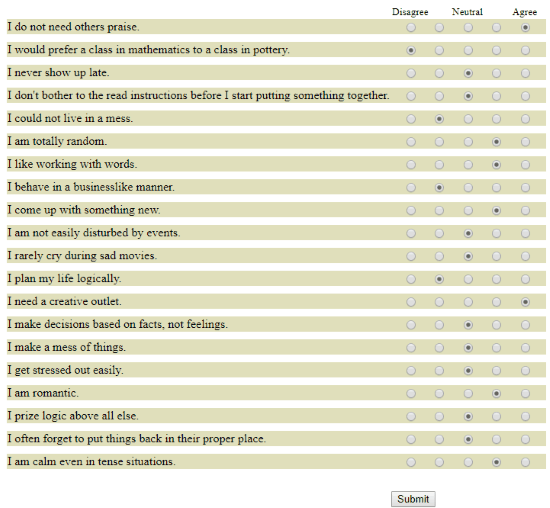 This test asks some simple questions about you, and you need to Agree or Disagree to these on a scale. The result is simple and shows the inclination on a scale. It also tells the difference between left brain and right brain. This test is available here. Right/left brain is again an Am I left or right brained test with 20 questions. In the form of questions, this test gives you situations. You just have to say Yes or No according to if you’d do the same. When the test ends it gives you a score and tells which side of your brain is more dominant. There’s also a paragraph which tells the meaning of scores. These websites will definitely help you figure out if you are left brained or right brained. Do not forget to share your result.